The Johnston County Visitors Bureau (JCVB) recently attended the Travel Leadership Conference held Oct. 3-5 in Southern Pines. The statewide DMO trade organization, Destination Marketing Association of NC organizes the event, which includes an annual awards program for excellence in destination marketing. JCVB was recognized with three awards this year for excellence in marketing. The Official JoCo Visitors Guide won a GOLD Destination Marketing Award for - Destination Publications. The visitors bureau prints 90,000 guides each year to promote the county&apos;s attractions, hotels, shopping, dining, and festivals. Our office distributes the guide to more than 125 sites in the county, as well as, NC Welcome Centers and AAA Offices from Canada to Florida. 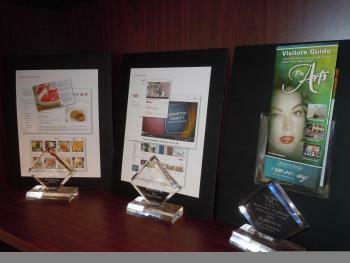 Winning a PLATINUM Award for Destination Marketing Initiative - Web, was the Five New JoCo Promotional Videos project. In 2012, the JCVB wrote scripts, filmed footage around the county, and helped to produce five themed videos based on the following niche markets: Arts & Entertainment, Shopping New & Old, History & Heritage, Agri-tourism, and Outdoor Recreation. The narration of the videos centered around the "JoCo Traveler", who was Patrick Brown, a TLC Home Improvement television host that now lives in Wake County. Our new YouTube Channel is where visitors will find the new videos. Future plans include adding to the channel with videos on "JoCo - Southern Style Cooking". Also winning a PLATINUM Award for Destination Marketing Initiative - Social, was the JoCo Strawberry Pie Recipe Goes Viral. The Johnston County agri-tourism market is a growing segment that support our brand of being a rural destination with working farms, on-farm experiences, farmer&apos;s markets and a variety of locally produced food products. This spring the Visitors Bureau chose to highlight pick-your-own fresh fruits and vegetables options by using great southern recipes and driving traffic to our websites, BLOG, Pinterest and Facebook pages. We were surprised and in awe, when the Strawberry Pie Recipe we posted started going viral, by the way, it&apos;s an incredible thing to watch. By the end of the summer, the recipe was shared over 74,000 times and seen by over 2.8 million people on Facebook. We hope to duplicate this again some day! Look for more incredible JoCo Recipes! The Johnston County Visitors Bureau is a quasi-government agency funded by the 3% county-wide occupancy tax paid by visitors staying in local hotel/motels and inns. Our agency is charged with the promotion of the entire county to attract and serve visitors, therefore, impacting the local economy through visitor spending, jobs, and tourism development.